Marcella joined our broodmare band in the spring of 2003. She had lovely conformation with a strong back, ideal hindquarters and a well-placed and shaped neck. She received excellent scores of 8, 7, 8/8, 7 (the old ATA inspection system) and was the first mare to complete the voluntary mare inspection. In 1990 Marcella was the ATA Reserve Champion Mare for her accomplishments in Dressage and Sporthorse in-hand shows. Under saddle, she competed with her previous owner to Second Level in dressage. Her first offspring, the gelding MARCHESE by Schwalbenherbst (bred by Janet Byrum) is following in her footsteps with numerous wins and High-Point Trakehner ribbons in Training and First Level. 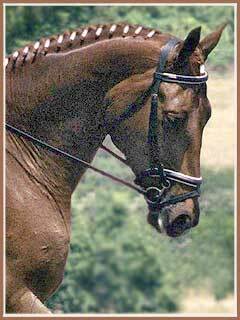 In March 2004, Marcella had a chestnut filly, MADIRA, by the Trakehner stallion Heling. Bred to the FEI Dressage stallion Emeer, Marcella once again produced a very nice chestnut, this time the colt MONARCH. 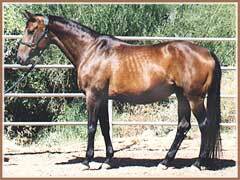 Marcella foaled a beautiful bay filly by the ATA-approved Arabian stallion Aul Magic on April 30, 2007. Marion is a substantial filly with strong conformation and athletic movement!